Tanzania's first safari areas were in the north, and this 'northern circuit' remains its most famous safari area. The Ngorongoro Crater and the Rift Valley's Lake Manyara are names to conjure with – whilst the Serengeti's great migration is one of the world's great wildlife spectacles; no wonder it attracts hundreds of thousands of human visitors every year! The urban sprawl of Dar es Salaam is Tanzania's largest and most important city, and a major gateway for international flights – although it's not the country's capital city! 'Dar', as it's often known, is fine for a night's stay, but most visitors pass straight through. 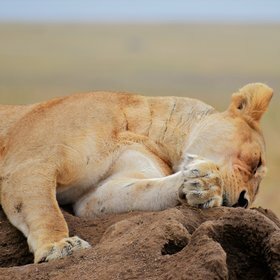 (Read more about Dar... ) Most Tanzania safaris in Southern Tanzania will pass thought Dar - whereas most safaris to Northern or Western Tanzania will use Arusha as their hub. In the northern circuit, the choice is more complex. The main parks here are relatively close together, and so private-guided safaris work very well – and are the obvious choice when small groups or families are travelling together. These have the advantage that you'll drive through the towns and rural areas, and be able to stop there – giving you insights into local life, and showing you what Tanzania is like outside its safari areas. However, travelling by road is a lot slower, and journeys can be bumpy, dusty and long. You'll normally travel in closed-cab 4WDs, and use the same vehicle for game drives; whilst these have a pop-top roof for game-viewing, they're not generally as good as open-topped game-viewing vehicles.